On this day in history, 1897, Elva Zona Heaster was found dead in her home, apparently from natural causes. Her body was discovered by a boy who had been sent to the home by her husband of only a few months, Erasmus Stribbling Trout Shue (also called “Edward”). Shue had sent the boy to the home to ask Elva if she needed anything before he came home from where he was working as a blacksmith. When the doctor, Dr. Knapp, came to examine the body an hour or so later, Shue had already washed and dressed it for burial. Specifically, he dressed her in a high necked dress and placed a veil over her face. Dr. Knapp examined the body briefly, but was hindered by the fact that Shue was cradling her head and crying and wouldn’t let her go to let the doctor examine her head and neck. When the doctor tried, Shue became violent, so the doctor left, finding nothing substantially wrong with the body from the parts he could examine and, because he had been already treating her for a few weeks for “female trouble”, he assumed the death was related, putting down the cause of death initially as “everlasting faint” and then later “childbirth”, or more aptly complications from pregnancy. Elva was soon buried, but not before people started noticing that Shue kept paying particular attention to her head area and would become animated when people tried to go near it. He also wrapped around her neck a scarf that didn’t match the burial dress, but told people it had been her favorite, so he wanted her buried in it. In addition to that, he put things around her head, such as a pillow and a rolled up cloth, telling people he was doing it so that she could rest more comfortably in death. Mary Jane Heaster, Elva’s mother, never liked Shue and was convinced from the beginning that he had murdered Elva, but as there was no real direct evidence known at that time that Elva had been murdered, the body was buried anyways. Mary Heaster then took to praying for around a month that her daughter would appear to her and tell her how she had died. Finally, after a month of praying, Heaster claimed her daughter appeared to her four nights in a row telling her that Shue had murdered her by choking her and breaking her neck because she hadn’t cooked any meat for dinner the night of her death. After four nights of this (one wonders why the first night wasn’t sufficient), Heaster went to speak with John Alfred Preston, the local prosecutor. 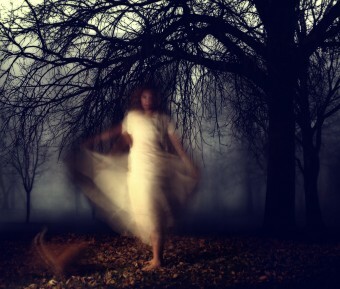 She told him of her daughter appearing to her and what the ghost had said. As you might expect, Preston was none too keen on her evidence, but went ahead and inquired of Dr. Knapp about the circumstances surrounding Elva’s death. When he learned that Dr. Knapp was not able to completely examine the body because of Shue becoming violent, Preston went ahead and re-opened the case. A few days later, the body was exhumed with strong objections by Shue and an autopsy was performed. Everything seemed normal at first until the doctors cut an incision along the back of her head and neck. What they found was the Elva’s neck had been broken, specifically in the first and second vertebrae. They further found that her wind pipe was crushed and there were indications of finger marks around her neck. At this point, it was clear Elva had been murdered and suspicion naturally fell to the husband because of his behavior after her death concerning her neck, but there still was no hard evidence that he had been the one to commit the murder. Indeed, one might think that her mother, who described exactly how her daughter had died before the autopsy was performed, might be just as plausible of a suspect as the husband. Further, the mother, known to despise the Shue, may have intended to make it look as if he committed the murder in order to frame him. Later evidence, though, would more strongly point the finger at Shue and the mother was never made a suspect as the townspeople generally believed her ghost story. What was soon learned was that Shue had been married before. The first marriage ended in divorce while Shue was in prison for stealing a horse. This woman, Allie Estelline Cutlip, also claimed that Shue was extremely violent and beat her frequently while they were married. Next, Shue married a woman by the name of Lucy Ann Tritt. This marriage ended after just eight months with the death of Tritt, reportedly under mysterious circumstances. Oddly, Shue also boasted in prison that he planned to marry seven women in his lifetime. However, even with his previous wife’s mysterious death and a record of abuse, there still was no hard evidence that he actually had been the one to break Elva’s neck and crush her windpipe. As such, he pleaded not guilty. During the trial, the prosecutor attempted to avoid bringing up the “testimony of the ghost” as it couldn’t be used as evidence, so would just be thrown out due to being hearsay. It also made Mary Jane Heaster look a little crazy; hence, her testimony against Shue might be invalidated in the eyes of the jury if this story were to be brought up. It was lucky for the prosecutor, though, that Shue’s attorney thought along these same lines. Thus, he brought the matter of the ghost’s testimony up while cross-examining Heaster in order to make her look insane. Unfortunately for him, Mary Jane Heaster’s story was delivered with such vehemence and believability that the jury actually seemed to be buying it and he quickly abandoned that line of questioning and dismissed her. Because the defense had brought the ghost’s testimony up and there was no objection from the prosecutor for obvious reasons, the judge decided to allow it and did not tell the jury to disregard the ghost’s testimony. Thus, despite lack of any direct, hard evidence, Shue was convicted of murdering Elva Heaster and was sentenced to life in prison (though ten of the jurors voted that he be hanged). Shortly thereafter, a mob was formed to break Shue out of prison and then hang him, but a man by the name of George M. Harrah notified the sheriff of the plan. The sheriff then took Shue away from the jail and hid him somewhere in the woods and returned to the jail and was able to disband the mob of around 30 men. Interred in nearby cemetery is Zona Heaster Shue. Her death in 1897 was presumed natural until her spirit appeared to her mother to describe how she was killed by her husband Edward. Autopsy on the exhumed body verified the apparition’s account. Edward, found guilty of murder, was sentenced to the state prison. Only known case in which testimony from a ghost helped convict a murderer. Spectral evidence was also famously accepted and used by the court under Chief Justice William Stoughton during the Salem witch trials.